To be an ace at Pickleball you need to give your A-Game every time which means using solid strategy, ball placement and quick thinking to outsmart your opponents. Remember, in Pickleball the team with least unforced errors wins. performing players. With practice these will transform your game and improve your star rank dramatically. 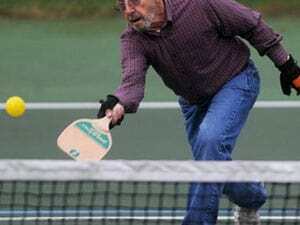 Since 90% Americans prefer playing Pickleball with a partner, we are first going to discuss the doubles tactics. A Doubles game requires you to have perfect coordination with your partner. It is entirely different from a singles game. Winning teams focus on the holes in defense of the opposing team and maneuver the ball accordingly. So without further ado, let us start with the most important strategies! Just like in doubles tennis, team which has a firm foothold on the net has a major advantage. Therefore throughout our guide, we will be focusing on how to get your team to the net in shortest time possible. All this happens rapidly within the first 5 shots. After that game is more about patience and capitalizing on the error opportunities. behind the baseline and then carefully serve the ball towards the center of court. Try to get the ball to bounce 5 feet from the opposite baseline. This has a unique advantage as it forces your opponent to stay back from the net and use their backhand as the ball lands almost at their feet. Avoid drop shots on the serve! It has a chance to hit the net resulting in service fault. Even if it works successfully your opponent will quickly run towards you and gain the net advantage. Returning Serve follows same rules as the First Serve; make a low pace shot a few inches from the center and 5 feet from the baseline. If you know your opponents capability, try to hit the returning serve towards the weaker opponent at their feet which forces them to use their backhand. A slow shot also allows you time to quickly sprint towards the non-volley zone line. Hitting the ball at the center can confuse inexperienced players and unsuccessful poaching attempts may follow. Be ready to bolt towards the net as soon as you make the return serve! Net advantage is critical in pickleball strategy, as soon as you make the return serve, immediately sprint towards the NVZ line while keeping your opponent’s position in mind. In case you are a slow sprinter, make a defense lob shot which will give you more time to cover ground. Failing to do so might give other team chance to acquire net which will get you on the defensive. i) It allows you to make smash or volleys in case of high up shots. ii) It allows your partner to match your movements and see you clearly. iii) It protects you against feet shots because of the net advantage. Understand, your partner is your other half. You should match the movements of your partner always and act as a seamless wall that slides in response to the ball movement. Try to keep a minimum distance of 8 feet or less between yourself and your partner at all times. Getting more distance will allow your opponent to strike in the middle. The third shot after return serve is very critical. If your opponents make a great return serve, then both of them will likely be at the net. In this case you need to gain net yourself. In order to do that, make the third shot a drop shot which lands in the kitchen zone. Though difficult to execute a drop shot will allow you to scramble towards your side of the net. Hitting a fast shot should be avoided as it will give you less time to scramble towards the net. This is a key pickleball strategy and must be mastered. In case you and your partner have not gained the net and opponent has already returned fourth shot; you must stop immediately and get in a ready position to play the shot. Assuming, you and your opponents are firmly established at the net, it is time to start the dinking game. Make short and low dink shots so that your opponents cannot have offensive advantage. While you are playing the dink shots, smartly make side dink shots to create gaps between your opponents. This exposes their defense and allows you to land a deep shot down their middle. Poaching is a very important pickleball strategy in doubles game. Poaching is performed when a player cuts across and hits the ball coming towards their partner. It makes your opponents wary, as you have a chance to surprise your opponents. Smart players actively poach or use fongeints to keep their opponents on edge. A sudden loss of concentration is all it requires for you to successfully land a point in doubles game. Though not a real pickleball strategy, understanding your partner’s strength and weaknesses is really important. If your partner is weak, help them carry their game and do not let your ego or pride get in your way. Also do not take affront if your partner makes frequent poaches as it is a key tactic in doubles games. In a doubles game volleys can be really effective surprise tactic however they must be executed with care. Play a volley shot only when you know how to take a fast return. Do not go for volleys unless your opponent gives you a high shot usually 12 inch above the net. You can combine volleys with angle shots for more effective game play. Volleys however are risky, highest percentages are low dink shots at the centre of the kitchen or NVZ. Pure Winners are shots in which you typically smash the ball hitting it fast and hard to score a point. Try these only when you are proficient and know that you will not compromise on consistency while making the shot. It is equally important to leave shots which are going to hit outside the court. These are unforced errors committed by your opponents. Anticipate these shots by knowing about the wind condition, your opponent’s inconsistency, angle of shot and your partner’s call. signals during a doubles game. Go for sideline shots to confuse your opponents, take advantage of weaker player and quickly score points if your team is already on the lead. A soft sideline shot at your opponent’s feet is usually returned with a bit of high shot. Be ready to return it by jumping high and doing a powerful volley or sideline smash. Apart from these winning strategies, always practice! Coordinate with your partner and learn their strong points. In a doubles game you both need to cover each other and play as a team. Keep the game fun and always respect your opponents! 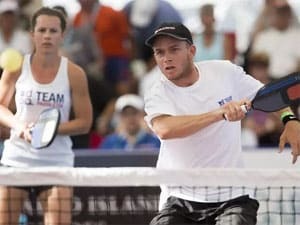 Singles pickleball strategy and tactics can be quite different from doubles tactics. Singles require much more maneuverability and focus more on sideline shots. Another major distinction in Singles game is the fact that you go for deeper shots down the NVZ line. Though not a strategy, one major difference is how the scores are announced. Server’s score is called out first followed by opponent’s score. There is no need to call out additional third score. Serving sides depend on the server’s score, if the server’s score is an even number; serve is always done from the left side while opposite holds true for odd number scores. Volleys are great for singles games, as you make a serve or return serve charge head on towards the kitchen line and force your opponent to make a passing shot. If you had hit your shot at the right angle towards their weaker backhand, the resulting passing shot would be weaker. Now it is time for you to capitalize, immediately follow with a volley by punching the ball with your paddle. Make both deep volleys and drop volleys, not letting time your opponent take a breather. Sometimes you can afford retreating in doubles games, but for singles volley attack playing at the kitchen line is your best bet. Singles games usually revolve around four shots; serve, returning serve, passing shot and volleys. To gain maximum advantage try hitting deep serves and returns which force your opponent away from the kitchen line. These are harder to return and allow you ample time to gain your own net advantage. Once at the net it is only a matter of time till you score a successful pure winner or side shot. Learn to judge the height of the ball; if it is high up above your reach, then you can perform a overhead short by moving your elbows up and punching the ball with your paddle. For lower heights try volleys. Just like in a singles tennis game, aim for corner shots at the far ends of the court. While doing this be careful not to make your shots go out of bounds. Corner shots will keep your opponent off-balance and tire them out faster as they over-exert themselves. Try to aim one foot inside the line and give yourself wind and error margin. Apart from a few exceptions, most of us are good at forehands. Capitalize on that and position yourself so you can deliver forehands instead of backhand. For added power, use two handed forehands to smash the ball at far corners of your opponent’s court. Work on your footwork, no matter wherever you are on the court always keep your feet side by side and keep an eye on your opponent’s movements. When at the kitchen line, be careful not to step both feet inside the line. To play incoming low drop shots lunge downwards like a sword fighter while keeping one foot out of the kitchen area. All pickleball strategy guides focus on footwork as key winning factor. Take a moment to think about the net, it is lower at the center while higher at the sides. Most of shots will be coming through the center; this will give you an important edge as you play the shots coming from the center. Try to surprise by playing shots from the side. These are difficult to execute but can help you in hitting corners or forcing your rival on backhands. 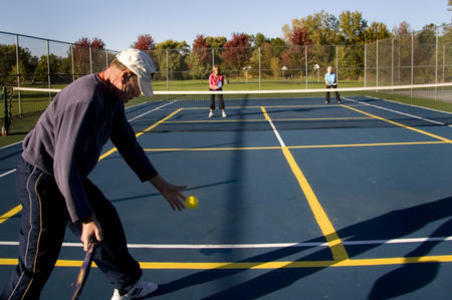 Pickleball can be a hugely entertaining game to play between your friends and family. No wonder, it has grown in popularity. Applying our pickleball strategy and tactics will transform you from an Average Joe player to a top performer. Practice makes you perfect and this holds true for all sports, pickleball is no exception. Our guide of playing strategies for both doubles and singles will ensure that you get satisfying wins over your opponents. Doubles require teamwork and close coordination with your partner, while singles are grueling and tiring favoring power, athleticism and quickness. Despite their obvious differences, both of them are equally fun and competitive. 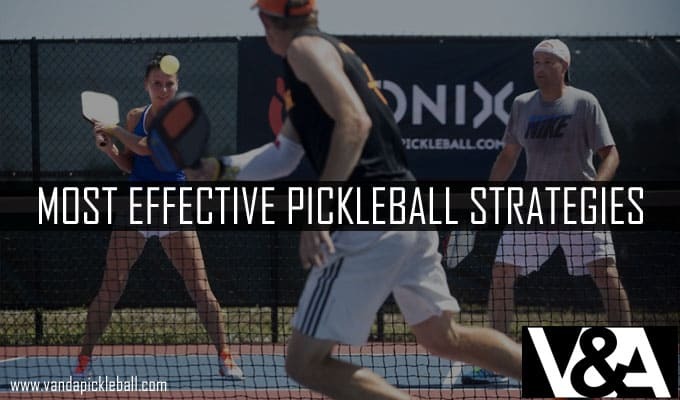 Keep practicing and follow our pickleball strategy guide to get comfortable with this brilliant game.